Last Christmas Wien-based Ukrainian label Kvitnu literally gave its heart: on the occasion of its 10versary, Kvitnu's guys decided to release this unique output, whose nice cover artwork (a distinguishing mark of the label under the wise visual supervision of Kateryna Zavoloka, the sound artist who signed this celebratory production) could vaguely resemble a psychedelic rendering of a cardiac muscle. It includes a fantastic track by Zavoloka herself, whose opening on what sound like treated bells has a scent of Xmas or birthday celebration before she ignites an electromechanical rhythmical spiral matching the aesthetics of which Kvintu became a sort of flag carrier, and a remix by Cluster Lizard, who transformed some elements of the original track, broke some kicking drums and added some high-voltage aural whispers to feed an enjoyable interstellar mental journey, combining so-called rhythmic noise and the ghosts of 70's synth-driven analogue electronica. Both tracks are available as free downloads, but you can also buy the CD version (priced 10€) or the 10" one (just ten copies are or were available). The last one costs 100€ but includes a lot of benefits: a big pack of Kvitnu stickers, a Kvitnu logo black t-shirt a personal 95% discount code for all items of Kvitnu shop that is valid over the whole 2017 and an unspecified surprise. The dark light of Kvitnu keeps on shining, and we cannot but wish its light can last longer and longer. Happy birthday! Multi-instrumentalist Janek Sprachta’s second solo album fuses electronic soundscapes with more traditional piano, guitar, and drums, The clicks and warm hums of the electronica layers are very familiar, the typical and common noises of this light drone genre- beautifully smooth and deeply cathartic, a soothing bath of gentle sound and extremely reverberant, immersive atmosphere. What prevents this release from sounding wholly generic is the acoustic feel of the real instruments. “Domi” has gamelan-like sounds and a touch of Eastern flavour, while the second track- whose name was badly mangled by the encoding in the promo I received so I’m not even sure what it’s called- is a brief, gently electronica-sprinkled piano ballad. Sprachta’s primary musical day job is as a drummer, and it’s on “Stones” that he indulges himself with a drum-led piece that’s a masterful bit of balance- part show-off drum solo (light and jazzy, certainly not rock), but part carefully measured and controlled groove. Throughout the whole album, the temptation to show off, the prog rock indulgence of “look how good I am at all these instruments” is admirably and consistently resisted- even down to the modesty of the 36-minute total running time. “Hello World”, in two parts, opens with a particularly cinematic string-heavy tone of melancholy, before filling out to the album’s busiest section, with a mood of concentration and a sense of passing time. It’s crying out to be paired with a short animation film about loneliness. The final track and title track “Grow” is more than twice as long as any other track and an opus in its own right. There are subtly William Orbit flavours in the synth arrangement but with a much wider sense of space. It opens with a couple of minutes of ballad piano which you expect to return towards the end, but instead, we drift off into a supremely long fade, as though finally succumbing to sleep. The result is an album that just shines with quality. While not breaking any new ground and while not as experimental or avant garde as they might want you to believe, nevertheless it’s a magnificent and beautiful bit of work. As the name either says or contradicts depending on how you look at it, Group Zero is a solo project from Cathal Cully, who spent four years gradually accumulating his own collection of experimental synthwave-ish works while on hiatus from the band Girls Names. While he’s the guitarist and vocalist here, you wouldn’t guess it from this bundle of purely synth instrumentals. Tracks like “The Fantasist” are ominous-sounding throwbacks to that raw analogue 1980’s sound, with slow arpeggios that could be labelled weedy but which work in context. Melodic lead lines sound not too dissimilar from early OMD elements, but without the full pop sensibility underneath. The “Pummelling Repetition Inside” when its prominent simple bassline is what I’d imagine Chicken Lips sound like when they’re grumpy. In Cully’s own words his home recording setup is “modest” and there’s a sense of that prevailing throughout the album. Sonically it’s got a fairly narrow spectrum, all staying quite firmly in warm and analogue-like territories, with only the crispness of the percussion really cutting through to any degree. With the exception of “Pyramid Of Light”, each track is essentially a single groove, arguably a single idea. Layers and elements come and go over time, but there’s nothing as audacious as a basenote change or a B section here. So it’s appropriate that most of the tracks are only three or four minutes long, otherwise their lack of internal variation might begin to overstay its welcome. Cully clearly knows which patterns are the most hypnotic, allowing tracks like the highlight “I Dream Unwired” and the nicely suspense-stretched “Vernissage” more time to breathe. “Pyramid Of Light” is a short ambient-drone interlude with distant guitar noodling on it, a brief suggestion of a different direction that Cully could have headed in if not lured into proto-techno sounds, which segues into “Love And The Present” with its anachronistic indie-pop twangy guitar that gives away Cully as a ‘live band’ performer rather than a studio native. Twelve-minute-long, digital-only bonus track “Zero Symphony” is also slightly atypical- a gradually building and tense affair of arpeggios, riotous distorted guitar noises and suspense strings that sounds like it’s the longest, most epic intro to a electro-rock album you’ve ever heard. Snare drums arrive after ten minutes but the electro-rock never comes- instead it runs out of steam, a definite anticlimax. There’s a definite “bedroom synth experimenter” flavour to this release but it’s certainly not without its merits. If thicker kickdrums and subbasses were added, you could label this a deep techno album, but as it is it could be described as a slightly self-indulgent home-listening affair, but well above average. 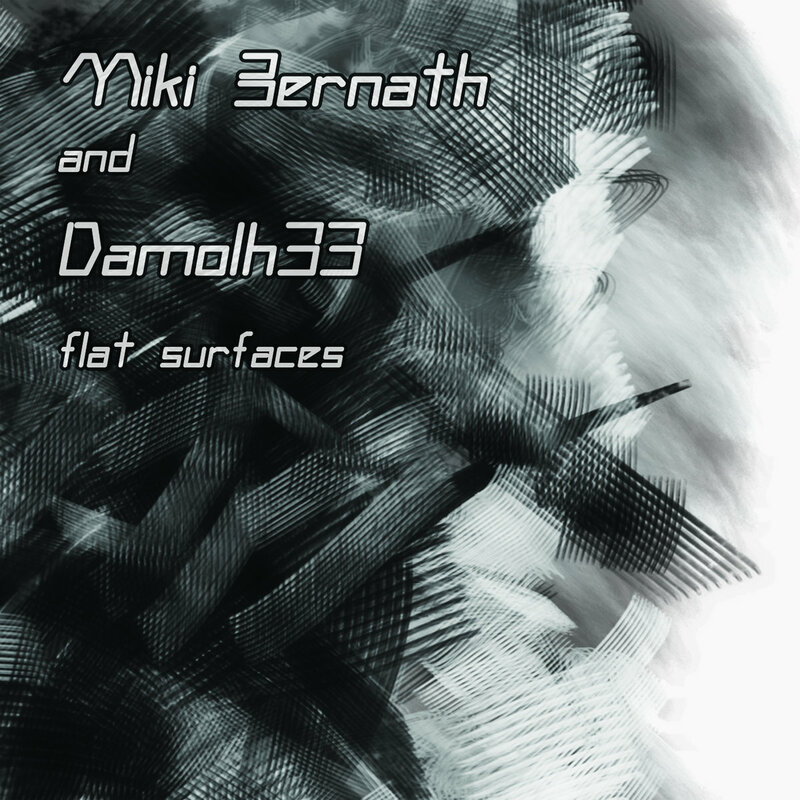 After several digital EPs released in the last four years for their own Damolh Records, the Slovakian duo Miki Bernath* And Damolh33 are releasing on tape their first album titled "Flat Surfaces" for 4mg Records. Run by Imrich Vegh, 4mg Records always proposed interesting releases that mainly interested the retro electro scene fans. With this six tracks album (two bonus are included into the free digital download), Imi widened the spectrum of the music released by his label thanks to Gabriel Bernath and Mikuláš Bernáth. The tracks of "Flat Surfaces" span from ambient electronic with i.d.m. influences to 90s electro techno. If you are into early Biosphere but you like also the luscious sounds of the Soma Records rooster, like Slam or Oktogen, plus a touch of Warp stuff, this album could definitely find a place into your playlist. "Flat Surfaces" doesn't contain vocals neither dancefloor hits, but it's able to create a sonic world of its own and this is the main thing for someone who's making music! Preview here "https://4mgrecords.bandcamp.com/album/flat-surfaces" and contact Imi! I'm not sure if the source for this output on Kvitnu by Belgian duo Stray Dogs (consisting of Frederick Meulyzer on percussions and electronics and Koenraad Ecker, who use electronics together with a set of guitars and a cello) is the same they grabbed in an icy deconsecrated church, which was the base for their previous album "Wasteland" and the soundtrack for the same-named dance piece by the renowned Norwegian choreographer Ina Christel Johannesen, but it seems they forged it as an adaptation of tracks composed for similar purposes that got premiered at Goteborg Opera House, Sweden, where Canadian choreographer Stephan Laks manages the related dancing company. The six tracks they included in "And the days began to walk" actually manage to be evocative by itself without any deserved reference to its origin. The supposed references to ancient myths and its parallelism against present time of the first two tracks play an additional role in feeding imagination. The title of the opening track, "Phaeton" seems to refer to the son of Apollo, who temporarily stole the notorious sun chariot (his father's "car" to enlighten the day according to Greek believers) to show he was a famous scion and almost burnt Earth (according to the myth, Phaeton's stunt caused the desertification of Lybia), and such a mythological reference perfectly fits the massively punching and the rising scorching progression (close to some stuff by Mika Vainio, Kangding Ray or Plaster) of the track, well-defined as "an unabating stream of swirling polyrhythms, cracked gongs and growling low-end, reaching ever higher to its own delirious disintegration" by label's introduction. Similarly the solemn procession of thuds, sinister clashes and the whole eerily menacing atmosphere of the following track "Lethe", including some field recordings these guys grabbed in the northernmost reaches of Norway, could vaguely resemble one of the five rivers surrounding the underworld of Hades, whose water had the power to cause oblivion to the spirits who quenched their thirst by them. The following two tracks have no apparent relations to myths, but both the acid bleeps of "Tokoroa" and the amazing "Pluvier" feature a guessed combination of rising corroded sonorities and tribal percussions, which could get matched to imaginary tribal dances. While listening to "Beacons", a listener could imagine to be in some subterranean laboratory and finding some well-covered dangerous machine, whose destructive power keeps on stay hidden, unchaining on the thunderous mechanical pulsations and the ominous dub echoes of the final "Sour Vanilla".